After technology, cars have always been my other passion. So you’d think the electric car, sitting at the junction of both my interests would be nirvana for me, right? Wrong. As a confirmed petrol head, I’ve always mourned the impending (if elongated) death of the internal combustion engine. But the reality of climate change and the finite nature of carbon fuels means most people accept the days of the IC engine are numbered. So I’ve steeled my nerve and gritted my teeth to take my first test drive in an all electric car, the new BMW i3. The Good, The Bad and The Ugly – I’ve always been a fan of BMW (read my review of one of my favourites here) but to my eyes the German marque’s styling has been increasingly questionable over recent years. The images and adverts I’d seen of the quirky i3 hadn’t helped allay my fears either. It’s understandable that BMW have gone for something new and different for this carbon fibre slice of the future but to me it often appears as a clumsy mix of lines, angles, colours and finishes. The Bangle models were famously controversial at launch, but they may have been a little ahead of their time and did grow on people. So it’s possible my opinion could change on this EV design, unlikely as it may seem at this point. The i8 that’s coming next summer is certainly more pleasing to the eye but it’s not the volume vehicle that BMW are hoping the i3 will be. The good news is that the car looks a bit better in the flesh and the white model pictured above that was in the showroom was smart. No doubt part of that improvement came from those £1,000 optional extra 20″ wheels. 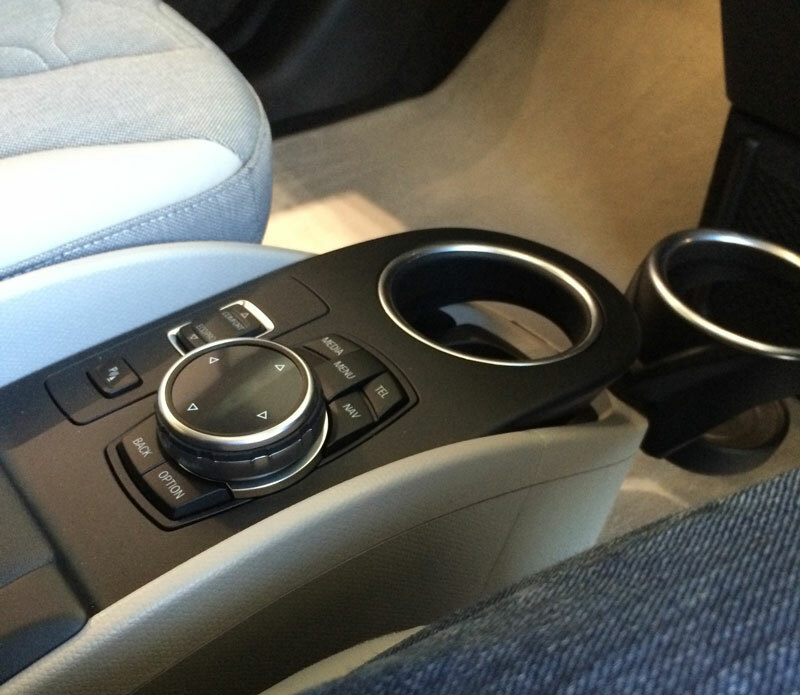 The inside of the i3 is quirky (there’s that word again) and mixes some familiar BMW controls with others that aren’t. The high driving position is pleasing and standard equipment across all models includes things like adaptive cruise control, bluetooth, satnav, multifunction steering wheel, automatic lights and wipers. The three trim levels above the standard car are named ‘the Loft’, ‘the Lodge’ and ‘the Suite’ and that tells you something about the thinking behind these designs that feature wood, leather and other natural finishes. One thing that is inexcusable in a supposedly premium car like this though is the door card. According to the salesman the interior door panels are manufactured from a recycled material and if that makes you think of nasty plastic park benches made out of bottle caps then you’re not far wrong. It’s a truly awful cold hard and unsightly material. The rear ‘suicide’ doors integrate the car’s B pillar structure and when both doors are opened create a large aperture for easy passengers access (the back door cannot be opened without the front opening first). In between the rear seats is a plastic panel of cup holders making the car firmly a 4 seater. That seems a strangely restrictive decision for what’s obviously a family car. There’s a typical smallish city car sized boot plus a compartment under the bonnet to stow your electric charging cable. The i3, in the tradition of BMW, is rear-wheel-drive. 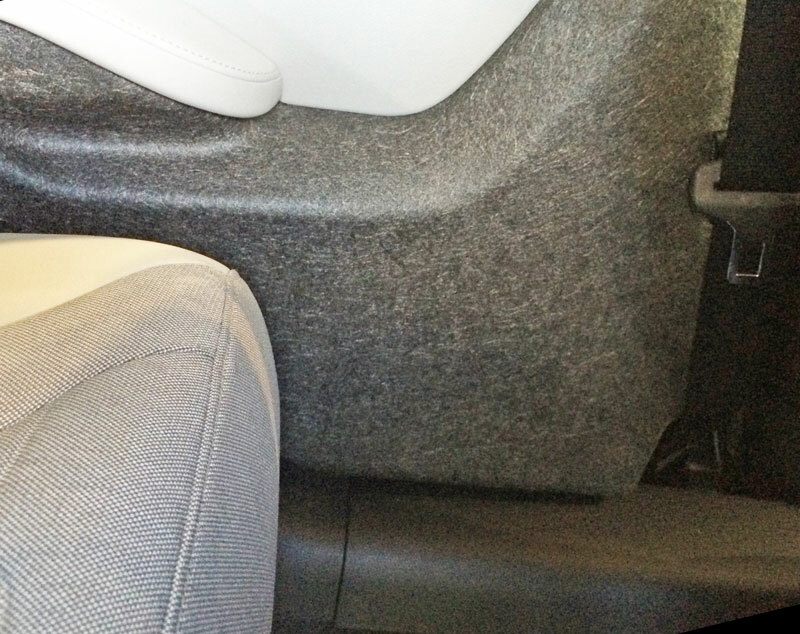 However the single rear-mounted electric motor, and resulting lack of front-to-rear drive shaft, means the familiar tunnel is missing giving the car more leg room in the front as well as the ability to easily shuffle across from one seat to another. As all RWD BMW owners know, you leave the car in the garage when it starts to snow. Our friendly sales man told us the combination of the low-slung lithium-ion battery pack and super skinny low resistance tyres makes the i3 much better in the white stuff than usual, although we’d like to see that for ourselves. The i3 is by no means ‘pretty’ then, but it’s supposed to be a practical urban people mover rather than a sleek coupe or sportscar. And styling is pretty subjective, so what’s it like behind the wheel? The Test Drive – The car has keyless start, as long as the key is in the cabin you can start the car. Well, I say start. Foot on brake, press the Start/Stop button and the dash and nav screen come to life, but that’s it. No noise. Flick the chunky control at the 2 o’clock position behind the steering wheel to D for Drive, release the electric handbrake and move off. There’s hardly a sound bar a slight hum from the eDrive system. There are two major things that are immediately different about the electric car driving experience. Firstly when you accelerate you suddenly understand that oft quoted fact that electric cars have their maximum torque available from zero rpm. The 170 bhp, 184 ft lb motor and lightweight 1,270 kg carbon fibre reinforced plastic (CFRP) construction all conspire to create a 0-60 time of just 7.2 seconds. That’s performance more akin to a hot hatch than the usual wheezy city car. Indeed it’s similar to a Mini Cooper S according to our BMW rep. Handling is sharp too, benefitting from the low centre of gravity, care of the batteries being mounted under the floor along the car’s wheel base. You notice the second big difference the first time you take your foot off the accelerator pedal. The car immediately starts to harvest kinetic energy to replenish its batteries and it’s just like you’ve started to brake. The car will actually turn its brake lights on during heavier decelerations even though you’ve not touched the left hand pedal. Within a few minutes though, your muscle memory takes over and you start to ease off the throttle pedal rather than lift off completely for the coast you’ve come to expect from your old-tech car. We drove a mixed route of urban, motorway and B road. At slow speeds the car has the eerie silence you probably expect, but on the motorway it sounds pretty similar to your regular car. It seems most of the sound you hear on the motorway is wind and road noise rather than that of your engine. The parking optional extras mean the car can actually parallel park itself. If you prefer to do it yourself then the rear camera is superb. Bright with a very wide angle lens plus guidelines to help you into your space. The car’s tight turning circle is another fine city car feature. Satnav moves from being a luxury option to a necessity with this sort of car and thankfully BMW have recognised that. Every i3 comes with its own built-in SIM card and 3G Internet connection and combined with the ‘BMW iConnectedDrive Services’ will plot your route and compare it to your battery range. It will find you charging points if required and even show if they are available or in use in real time. Once you stop for a charge you can head off to the coffee shop and check how many miles are in your battery remotely from your smartphone. You can even make the car warm the seats or cool the cabin for your return. Range Anxiety – BMW say the i3 range is 80-100 miles using the regular ‘Comfort’ driving mode. In addition the ‘Eco Pro’ and ‘Eco Pro+’ modes can extend the range to 118 miles by reducing the cars performance as well as restricting things like how cold the aircon goes or how warm the heated seats get. For the ultimate range anxiety cure, BMW have come up with their “Access” plan that provides the option of swapping your i3 for a regular engined BMW vehicle if you’re planning the occasional long trip. Like everything else though, it has an associated cost (around £40 / month to qualify for one weeks use of a car). The optional 32 Amp ‘BMW i Wallbox Pure’ is £315 fitted and lets you charge your BMW i3 to around 80% in less than 3 hours. With the car’s iOS and Android smartphone App you can employ its 7 day timer to charge at off peaks rates where available. Without this box at home you’re looking at around 11 hours to fully charge from any regular 13 amp socket. 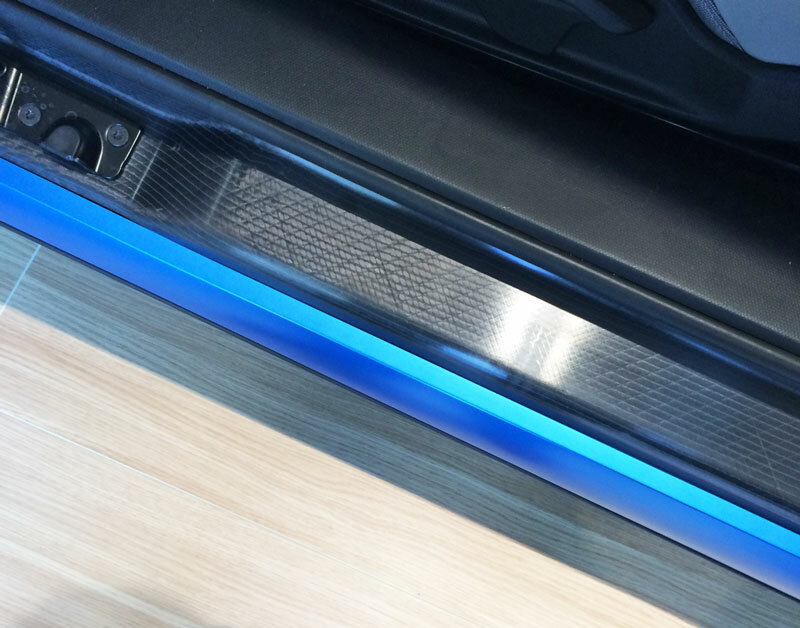 It seems a little mean, but you need to spend almost £600 to add the ‘DC Rapid Charge preparation’, an extra port under the car’s rear flap to allow it to take advantage of the fast (~30 minutes to 80%) public chargers that are starting to appear. If you’re really worried about range then the i3 with Range Extender model adds a 650cc petrol engine supplied by BMW’s motorbike division (along with more weight and a corresponding reduction in performance). Rather than drive the wheels it acts as a generator that charges the cars batteries and can provide an additional 50-86 miles of range from its 10 litre tank of fuel. You can keep topping this up at a petrol station for basically endless range if you like. Our salesman said around half of the i3’s sold from his dealership so far have been the range extender model. But at £3,000 extra you’re only adding to the irony if you’re buying an electric car to save money (for the train spotters amongst you, you can identify an i3 range extender as it has a second flap at the front of the car for the fuel filler). Interestingly he also told us they had seen new customers in the showroom including ‘computer people’ and ‘environmentalists’. His dealership expects to sell around 60 units in the next 12 months. Economics – There’s no on-going monthly hire or lease charge for the i3’s battery, unlike many other electric cars currently on the market. BMW give an 8 year/100,000 mile ‘high-voltage battery warranty’ – that’s industry leading next to alternatives like the Nissan Leaf, Vauxhall Ampera and Renault Zoe. Residual values are an unknown at this point and the sales guy said BMW are ‘heavily subsidising’ the Personal Lease options to encourage customers to go down that route. The starter price for the basic model in standard spec with an 8,000 mile per annum contract costs £2,995 down and 36 months at £369. BMW’s usual extensive (and expensive) range of optional extras are all available. For example you can upgrade the standard 6″ nav system to a 10″ version, but that alone will add almost £1,000 to the price. We got a quote for the basic trim car, bumped the annual mileage to 10,000 and added a slightly upgraded alloy wheel, heated seats and the parking sensors and rear camera package. This brought the Personal Lease to £423 per month (with the same £2,995 down) or an outright on the road purchase price of £27,420. That’s the actual amount you’d pay, the £5,000 government subsidy has already been subtracted from the £32,420 full price. To offset that, our sales guy calculated that the savings we’d make on fuel (even with our already frugal 1.2L car) and the free road tax would be around £100 per month. But how does this all stack up against something like the £21,000 Golf Bluemotion that can return 80mpg? If you’re a masochist you could try and wade through the mire that is BMW’s website and use the i3 builder to spec up your own dream EV. To Buy or Not to Buy – All in all my first experience of an electric car was much more positive than I had imagined. I certainly had some pre-conceptions about these types of vehicles and while some were upheld others were not. BMW are to be commended for building their zero-emissions vehicle from the ground up rather than electrifying an existing platform as so many other manufacturers have done. Given another generation (or two? ), some improved styling and better pricing then I can see a time when it will become a very real option for our second car. As with the Tesla, we need some buyers to invest in these 1st generation cars so the rest of us can take advantage of the progress to the subsequent models they will fund. For now it’s unlikely anyone will be able to give you an economic reason for buying one, more likely it will be a moral decision. While I’m often prepared to be that early adopter with my technology purchases, for now I’m going to leave the pioneering electric car buying to others. 4 Comments on "Review: BMW i3, My First Drive in an Electric Car"
I test drove a Nissan Leaf back in March (warning: embarrassing video embedded!) and could mostly live with the range limitation, though the extender would be handy for driving to Derry and back! But there seems to be a high cost to saving the planet: too high to make an electric car viable now. Nice car, but with the range extender it’s almost £30K with the government’s £5K sweetener. Living in the real world, without a company car or such perks I’ll have to wait a few years to afford a second hand one. Nonetheless, I have to admire BMW for going ahead and putting it into production. It’s about £10K more than a top-spec Nissan Leaf but IC BMWs aren’t Nissan money.